This is where I was at around dinner time,(a dinner that went uneaten, fyi) I decided to TURN IT AROUND. I threw in the towel and picked a fight with my husband. (At 7:00, he's still at work) "you never help with Christmas! You don't care enough about the CHILDREN and their MEMORIES to get off the COUCH." I unleashed hell on that man. Unfortunately for him, he tried to calm me down with logic (um, have we met before?!) "I am working unusually late nights during December. I'm just exhausted." "Well be prepare yourself to drag your exhausted [insert expletive here] down to the tree lot this weekend! We're trying a REAL tree this year!" He then "gave me permission" to do so. AS IF I NEEDED IT. And now I'm just so upset at... I don't even know what any more, and don't want to do Christmas decorating at all this year. 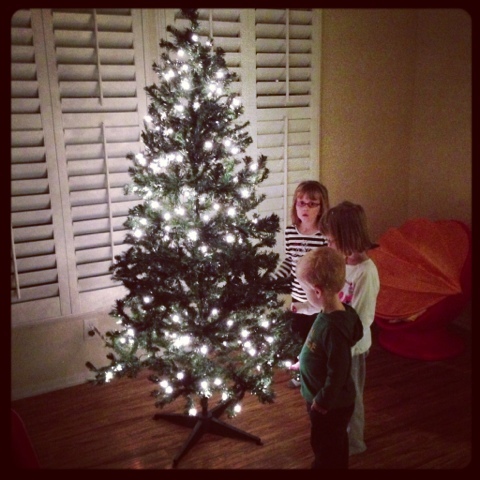 Except that the kids are positively insane about the crappy half-lit tree in our playroom. They bid it goodnight. They tell the tree Merry Christmas. I give up, holidays. 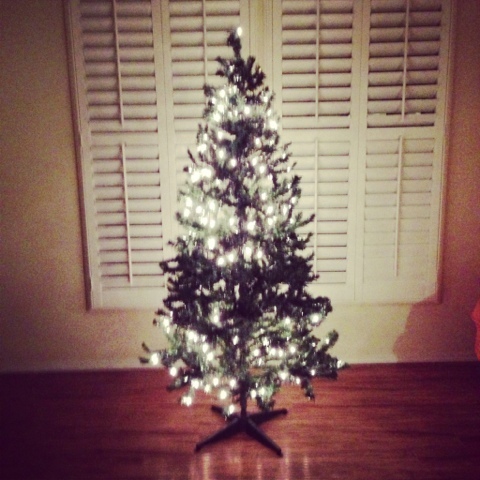 I was simply never good at this; Someone come decorate my house. Sad! Go grab a real one, the smell alone will lift your spirits! OH I feel the same way about decorating for Christmas. This year my son is almost 4 so he's totally into everything "Christmas"- thank you disney channel!(not)! We bought our real tree last night and the smell is slowly putting me into the holiday mood. Maybe a real tree will do it for you too!